I try to lay low on the food blog posts, but I’ll be honest, eating is an integral part of our everyday lifestyle. Los Angeles is a cultural hodgepodge with over 140 countries represented, and our food selection certainly reflects that. Off the top of my head, I can access my favorite Mexican, Korean, Brazilian, Ethiopian, Argentine, Japanese, Peruvian, and even Himalayan restaurants within a 10-minute drive. 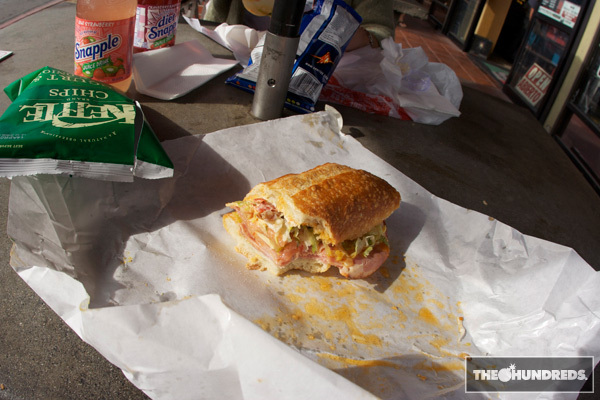 But sometimes I just want a good sandwich, and Bay Citiesin Santa Monica is the deli for that. This spot’s an L.A. landmark located just blocks from the beach. The parking lot is a dizzying whirlpool of honking cars, so park at a meter around the corner. You gotta pull a number at the deli, where you’ll wait impatiently along with 30 or so other anxious customers who’re ready to get their sandwich on. 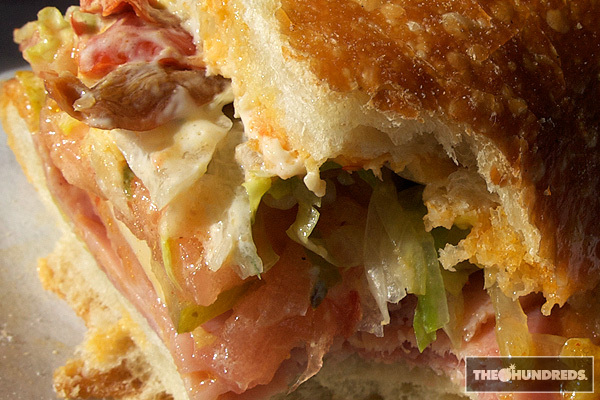 I’m always down for the “Godmother,” which isgenoa salami, mortadella,coppacola, ham, prosciutto, and provolone in an Italian roll. And when it comes to drenching your sandwich in “mild” or “hot” pepper juices, just be aware that “hot” is more like “asphyxiating death.” If you don’t wanna wait in “line,” (more like a mob) which is kinda part of the experience, you can also order online beforehand and just pickup your order at the back of the shop. Swoop on a bag of chips, a drink out the fridge, and might as well get some groceries while you’re at it. This is a gourmet market after all. Best sandwich in Los Angeles. Hands down.